An unforgettable time at Lee Valley Water Centre! Since London hosted the Olympic and Paralympic games in 2012, Lee Valley Regional Authority has been making sure the Olympic legacy lives on and benefits communities in and around London through their Community Access Fund (CAF). 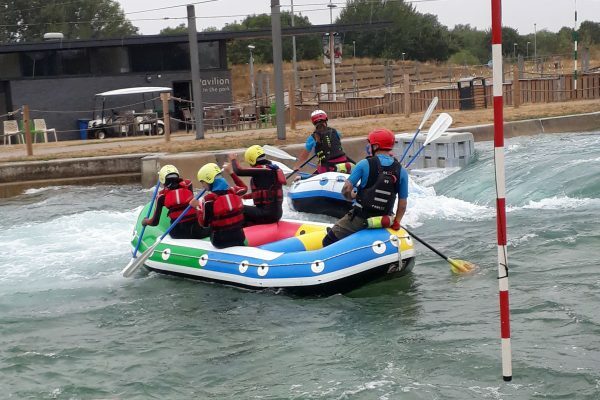 This summer we took advantage of this funding to take a group of 15 of our youngsters to Lee Valley Water Centre, Waltham Cross, on three separate Thursdays in August. What a great set up! This centre, that played host to the canoe slalom events, now offers a wide range of water sports activities. Since this was a first visit, the youngsters did kayaking, stand up paddleboarding and white water rafting; leaving hydro speeding, hot dogging, tubing and water wipe-out for another visit! Navigating the unpredictable white water rapids provided a real adrenaline rush, and despite being kitted out in wetsuits, wet boots, helmets, and buoyancy aids, everyone got a good soaking! The instructors added to the fun and ensured everyone had a blast while keeping a close eye on the group’s safety. The feedback from all the youngsters who attended was fantastic! Everyone grew in confidence over the three trips and at the end of the final visit, some looked like they could be ready for the next Olympics! We’ll certainly be back next year if CAF funding is still available to us. ← We’re in the news!